This article is about the year 1690. English Regnal year 2 Will. & Mar. – 3 Will. & Mar. Wikimedia Commons has media related to 1690. 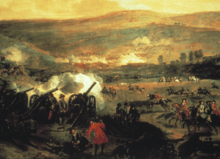 July 11: Battle of the Boyne. January 6 – Joseph, son of Leopold I, Holy Roman Emperor, becomes King of the Romans. January 7 – The first recorded full peal is rung, at St Sepulchre-without-Newgate in the City of London, marking a new era in change ringing. January 14 – The clarinet is said to have been invented in Nuremberg, Germany. February 3 – The Massachusetts Bay Colony issues the first paper money in North America. May 20 – England passes the Act of Grace, forgiving followers of the deposed James II. June 14 – King William III of England (William of Orange) lands in Ireland, to confront James II. June 8 – Siddi general Yadi Sakat razes the Mazagon Fort in Mumbai. July 10 – Battle of Beachy Head (also known as the Battle of Bévéziers): The Anglo-Dutch navy is defeated by the French, giving rise to fears of a Jacobite invasion of England. July 11 – Battle of the Boyne, north of Dublin: King William III of England (William of Orange) defeats the deposed James II, who returns to exile in France. The rebellion in Ireland continues for a further year until the Orange army gains full control. July 26 – French landing party raids and burns Teignmouth in Devon, England. However, with the loss of James II's position in Ireland, any plans for a real invasion are soon shelved, and Teignmouth is the last-ever French attack on England. August 24 – In India, the fort and trading settlement of Sutanuti (which later becomes Calcutta) is founded on the Hooghly River by the English East India Company, following the signing of an Anglo-Moghul treaty. September 25 – The only issue of Publick Occurrences is published in Boston, Massachusetts, before being suppressed by the colonial authorities. October 6–12 – Massachusetts Puritans, led by Sir William Phips, besiege the city of Quebec; the siege ends in failure. October 8 – Great Turkish War: The Ottomans recapture Belgrade. November 17 – Barclays is founded in London, England. December – The planet Uranus is first sighted and recorded, by John Flamsteed, who mistakenly catalogues it as the star 34 Tauri. December 29 – An earthquake hits Ancona, in the Papal States of Italy. Serbian Patriarch Arsenije III Carnojevic leads the first of the two Great Serbian Migrations into the Habsburg Empire, following Ottoman atrocities in Kosovo. The Hearth Tax is abolished in Scotland, one year after its abolition in England and Wales. French physicist Denis Papin, while in Leipzig and having observed the mechanical power of atmospheric pressure on his 'digester', builds a working model of a reciprocating steam engine for pumping water, the first of its kind, though not efficient. Arcangelo Corelli publishes his Concerti Grossi. The Barrage Vauban, a defensive work in the city of Strasbourg (in present-day France), is completed. Possible year of the disappearance of the western part of the island of Buise, in St. Peter's Flood. ^ Rice, Albert R. (1992). The Baroque Clarinet. Oxford: Clarendon Press. pp. 17, 40–42. ISBN 0198161883. ^ (the battle took place on July 1, according to the "old style" Julian calendar in use at this time by the English. This is equivalent to 11 July in the "new style" Gregorian calendar, although today it is commemorated on July 12). ^ a b Williams, Hywel (2005). Cassell's Chronology of World History. London: Weidenfeld & Nicolson. p. 285. ISBN 0-304-35730-8.